Maria Linforth-Hall of wine events company Wine Connections recently invited me to attend one of her high-end wine discovery dinners, this one focused on Burgundy. Maria organises tastings and events in the City of London, and this dinner at the excellent The Don restaurant in St Swithins Lane close to the Bank of England was hosted by Maria and Richard Bampfield MW, with a mix of city workers and wine lovers from further afield in attendance. Maria likes to add something unusual and entertaining to the events, so before we settled down for a dinner matched to Grand Cru Burgundies and a selection of top New World Chardonnays and Pinots Noir, there was a most unsual little competition: on a table lay a dozen bunches of grapes, identified only by a number. Around the table were a number of wines – an English sparkling wine, a Chablis, a Burgundy, an English Pinot Noir and a red Bordeaux. All of the bunches of grapes had come from the very vineyards represented by the wines; flown in from France or collected from Sussex. 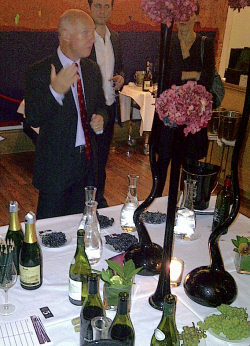 Richard spoke briefly about each wine, before we enjoyed two glasses with each course. It was interesting to note that the New World/Old World differences were not nearly so pronounced as the stereotypes of Burgundian vs. Californian, New Zealand and Chilean Chardonnay and Pinot Noir might have suggested. Some of the New World examples were made in a very reserved, savoury style, whilst the Batard-Montrachet in particular was so youthfully full of creamy oak and sweet fruit that it foxed many of the tasters into thinking it came from the golden state. The truth was however, that all of these wines worked really well with the sympathetically chosen food, showing again that when handled with some sensitivity Pinot and Chardonnay are two of the world’s great gastronomic wine grapes. From the Sonoma Coast of California, this is tighter and has slightly more floral and blossom notes, with orchard fruit and a touch of nectarine. The palate does not quite have the dynamics and unforced power of the Burgundy, but it has such beauty and such finesse. A terrific Chardonnay. 93/100. See all UK stockists on wine-searcher. Fantastically ripe and almost minty, this is super slick with a gorgeous, velvety depth of aroma showing a little vanilla and dark, quite earthy fruit richness. On the palate it has great purity, there is a fine acidity and though it has refinement, it is fairly lean and lacks just a touch of flesh into the long finish. 92/100. See all UK stockists on wine-searcher. Only 600 bottle are produced from a tiny, 0.47 hectare plot. Classic Burgundian nose, where pungent farmyard notes meld with mushroom and sweet, damp earth. There’sd a stalky, herby note too that adds complexity and austerity; this is a wine only for those who can tolerate some Brettanomyces. On the palate it has a sinewy, taut backbone of cherry acidity, and the inherent sweetness and smoky hint of richness is draped over that framework meaning it finishes elegantly and with good length. 92/100. See all UK stockists on wine-searcher. From New Zealand’s best-known, biodynamic Pinot producer this is plummy, ripe and chocolatey with a dark touch of prune and rhubarb. The palate has a huge, deep slick of liquorice-edged concentration. There’s a big tannic grip, a lot of tart cherry and plum-skin too that gives a leanish, high acid note, but it is very fine. 92/100. See all UK stockists on wine-searcher. From one of Chile’s most exciting Pinot producers and regions, this is fabulously ripe and deep with masses of succulent cherry fruit and chocolate, a minty concentration and terrific, plush confidence. The palate has gorgeous fruit weight too, the silky tannins, creamy, dark oak and delicious red fruit and rhubarb tones that retain a little edge. A seriously good New World Pinot Noir this. 93/100. See all UK stockists on wine-searcher. Pierre Moncuit, Champagne Demi Sec Blanc de Blancs. 90/100. A terrific evening all round with some seriously good food from The Don too. Get in touch with Maria at Wine Connections for information on future events.